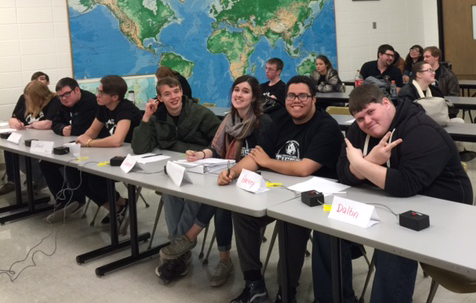 On Saturday, January 23 the Cowley AEC (Academic Excellence Challenge) teams headed to Cloud County Community College, in Concordia, KS to attend the NAQT (National Academic Quiz Tournaments) Sectionals Tournament. The tournament was attended by 14 teams from eight community colleges. The tournament was in round robin format, in which each team plays once versus every other team in their bracket and once against each other. Each team had one “bye” round and played against the “bye” team from the other bracket. In order to preserve fairness, the bye round game would not count against a team’s record. Cowley was represented by three teams: Cowley A, consisting of Amy Austin (captain), Daltin Brock, Garrett Misora and Harvey Baker; Cowley B, consisting of Alex Geurin (captain), Shane Kieffer, Jesse McCabe, and Mady Mitchell; and Cowley C, consisting of Aishah Alhomsi (captain), Adam Glenn, and Lucia Morales . Cowley A finished in third place, after losing in a tiebreaker for second place with Johnson County A, Cowley B finished in 11th place, and Cowley C ended in 13th place. Redlands A came in first place, Johnson County A took second, and Cowley A placed third. In addition to team rankings, individual players were also ranked according to points per toss-ups heard. The top five players were Marco Salas, from Redlands A; Brandon Hattesohl, from Johnson County A; Austin Naramore, from Cloud County A; Sam Dicke, from Redlands A; and Dan Stilley from Johnson County A. Marco Salas received a plaque for being the top scoring individual in the tournament. Garett Misora was Cowley’s overall top finisher placing 10th out of 55 competitors, followed by Alex Geurin at 12th, Daltin Brock at 13th, Amy Austin at 16th, Lucia Morales at 17th, Jesse McCabe at 28th, Harvey Baker at 31st , Aishah Alhomsi and Adam Glenn at 33rd,Shane Kieffer at 35th, and Mady Mitchell at 52nd. Coming out of preliminaries, Cowley A was in third place at 5-1, having only lost to Johnson County A. At the end of playoffs, Cowley A had won two games versus Cloud A and Johnson County B, and lost versus Redlands A. They were tied for second place with Johnson County A with a record of 2-1 and went into a tiebreaker match in which they were defeated. By placing first, Redlands A received a championship plaque and the opportunity to attend Nationals in Atlanta, GA in the last week of February. Since no Cowley team qualified for nationals, the next tournament they will attend is the Eastern Regional tournament at Allen County Community College. If you want to learn more about Cowley AEC, contact Dianne Flickinger, AEC Sponsor dianne.flickinger@cowley.edu.